“What does a play about actors and the theatre mean?” These may be indignant words taken from the mouth of the frustrated Krzysztof (Tadeusz Huk) but it’s a question pertinent to the film it appears in, Agnieszka Holland’s first major feature, Provincial Actors. The director has oft been quoted as stating that this was not a ‘thesis film’ and that she intended to present characters’ entwined fates rather than make a political statement. 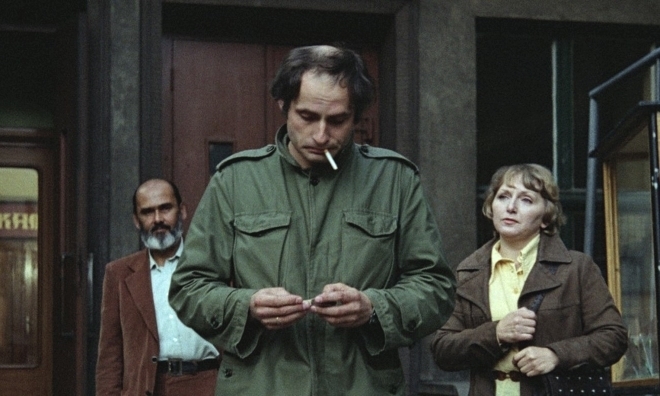 Of course, any work produced in Poland in the late 1970s is inextricably enmeshed in political dialogue – more so a film completed in 1979 when Holland was to leave the country for exile in France in 1981 immediately prior to the introduction of martial law. On the surface a portrait of the behind-the-scenes preparations for a theatre production of Stanisław Wyspiański’s 1903 play, Liberation, it can be read as simply as that. The tensions of interpersonal and professional relationships are exposed during this stressful period, not least that of the closest thing the film has to clear protagonists, lead actor Krzysztof and his increasingly distant wife, Anka (Halina Labonarska). However when another actress, Hanka (Kazimiera Nogajówna) is unhappy with the cut of her costume and quips “must the muse be pregnant?” the young director, Slawomir (Tomasz Zygadło) responds that all literature must be pregnant. Quite besides the dramatic irony of this observation coming from a character intent on stripping away Liberation’s underlying meaning throughout the runtime, it’s an excuse to at least pick at Provincial Actors’ Gordian knot of representation. Even ignoring the allegorical, the artistic repression of the era is palpable in the hidden pressures existing just out of frame. The tight camerawork emphasises this, trapping the players on their stage with the lights beaming down upon them. The suffocating atmosphere of the actors’ social circle is punctuated by Anka’s sojourn out to meet an old friend. There’s a moment when she admits that her current role is as a crow that prompts giggles that seem like a euphoric release, but it’s short-lived and Anka flees back to her stifled marital reality, afraid of tasting the freedom that others enjoy. “I know when and where to tow the line,” admits one character, summing up both the micro and macro readings of Holland’s debut. The Kinoteka Polish Film Festival takes place from 7-28 April 2016. For more coverage, follow this link.